Yes! In case you haven't heard, there's a new "Star Wars" movie in the galaxy, and it is awesome. This new installment takes place 30 years after the Rebel Alliance's victory over the second Death Star ("Return of the Jedi"). The galaxy is still at war, and a New Republic has arisen, but the First Order has sprung from the ashes of the Galactic Empire. Many of the heroes we all know and love - Leia Organa (Carrie Fisher), Han Solo (Harrison Ford), Chewbacca (Peter Mayhew), R2-D2 (Kenny Baker) and C-3PO (Anthony Daniels) - are still active and fighting in the Resistance. They're joined by new heroes, including Poe Dameron (Oscar Isaac), a starfighter pilot; Finn (John Boyega), a former First Order Stormtrooper; Rey (Daisy Ridley), a scavenger; and a rolling droid known as BB-8. And of course, there are some new dark forces: Captain Phasma (Gwendoline Christie) of the First Order and Kylo Ren (Adam Driver), a mysterious dark side user wielding a red lightsaber of unusual design. Let's just go ahead and put every long-running franchise reboot in the hands of J.J. Abrams, who directed this film. He's also either directed, written or produced reboots of "Star Trek," "Mission: Impossible" and the upcoming super-secret "Cloverfield" sequel. Oh, he can do new stuff, too - "Alias," "Fringe" and "Lost," to name a few. There's a lot to love about this new "Star Wars," but my favorite thing is the fresh young talent of Daisy Ridley and John Boyega, who not only have great chemistry, but are fun to watch. Oh my gosh, I love these two so much, especially since Ridley seems primed to take the reins from Harrison Ford as the new rebel fighter. The force is strong with this one, and I can't wait to see the next "Star Wars" movie, Episode VIII, scheduled for a 2017 release. 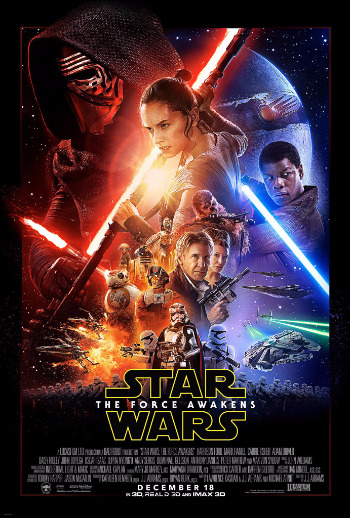 PARENT INFO: "Star Wars: Episode VII: The Force Awakens" has tons of sci-fi action, including space battles, crashes, explosions and lightsaber duels. There's not a lot of blood and gore, but villains order the mass murder of civilians, prisoners are coerced both physically and with the Force, and duels lead to injuries and death, including a main character. Language includes "dammit" and "hell."